The things I learn while scouring Berks County for great food never cease to amaze me. I have learned about towns and communities that I otherwise would have never visited, discovered new – and rediscovered old -foods, and I have found unexpected patterns among various restaurants. For instance, many locally owned restaurants are closed on Mondays (or Tuesdays). Because of the high volume of business on Saturdays and Sundays, this becomes their weekend. However, there is one notable exception to this rule: pizza places. I didn’t realize until recently just how many Italian restaurants and pizza places are closed on, or open for dinner only, on Sundays. That’s a problem when you’re looking for a slice of pizza after church. Thankfully, we found Esposito’s Restaurant & Pizzeria. 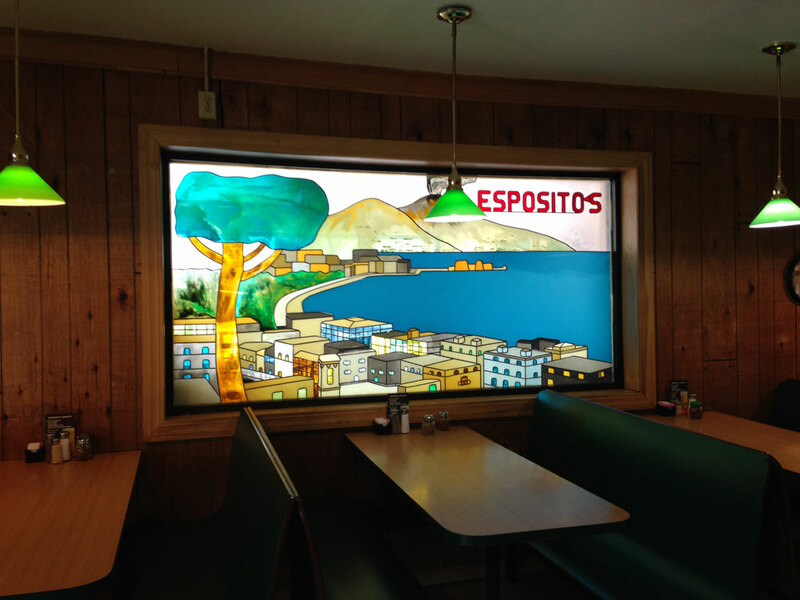 Esposito’s is located just east of the city along Friedensburg Road, right up the street from Bixler’s Lodge and not far from Bertie’s Inn, two places we have visited before. The fact that it’s not too far away is great; the fact that it is open every day at 10:30 a.m. was even better. We arrived on a Sunday just after 12 noon. 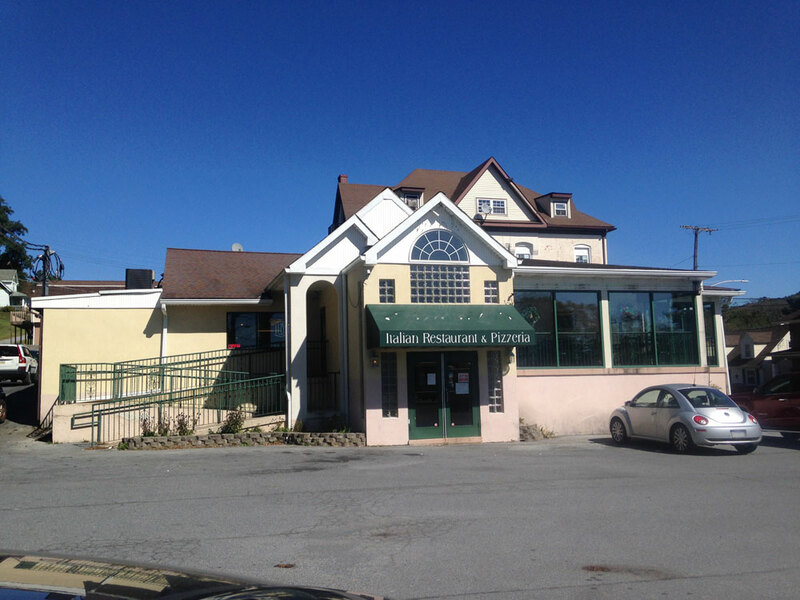 We were led through one dining area – a darker room with old-school pizzeria booths – to the enclosed wrap-around porch. We basked in the sunlight as we watched the cars pass by outside. There were only a few customers at first, but a steady stream of people started coming in while we sat. 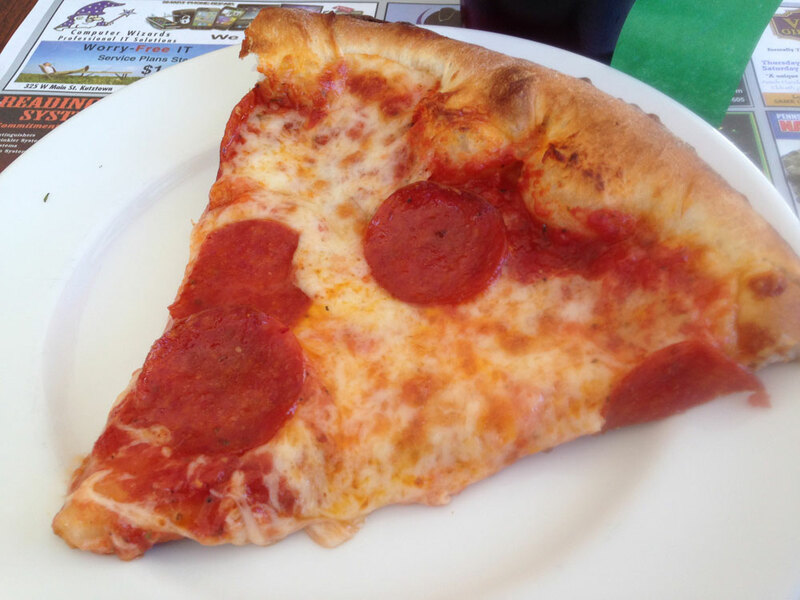 Learning from previous mistakes, Julie and I decided to split a small pizza, opting for a traditional pepperoni pie. We also ordered French fries (mostly for me) and a salad for Julie to get her through until the pizza arrived. The simple salad was out very quick. 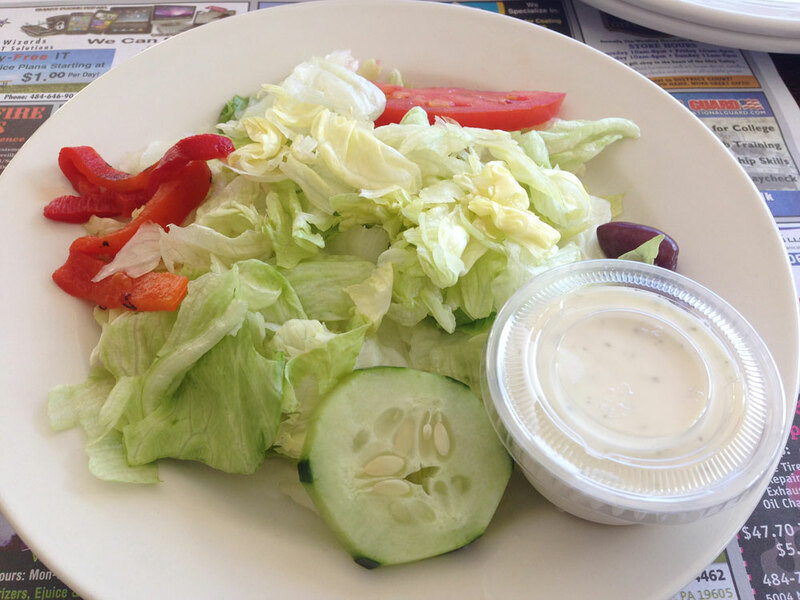 It was mostly lettuce, garnished with cucumber, tomato, red peppers and olives. The peppers were a nice addition. The olive, not so much. Julie has been eating olives more lately, but she didn’t realize until she bit in that the olives weren’t pitted. Oops. Otherwise, the salad did the job, though she wasn’t able to finish the whole thing before the pizza arrived. There’s nothing artisanal about Esposito’s pizza. On the contrary, this is a straightforward pie that’s a little on the greasy side. What we really liked about it was the crust. It was a little bit thicker than average, and very light and airy around the outside. Here’s how I gauge how good a crust is: Julie never eats the crust. She ate the crust here. It made it different enough to make it stand out from other restaurants. My fries had actually arrived just before the pizza, giving me a chance to nosh on them as an appetizer. They were the battered kind – extra crispy with bits of batter hanging off the taters. 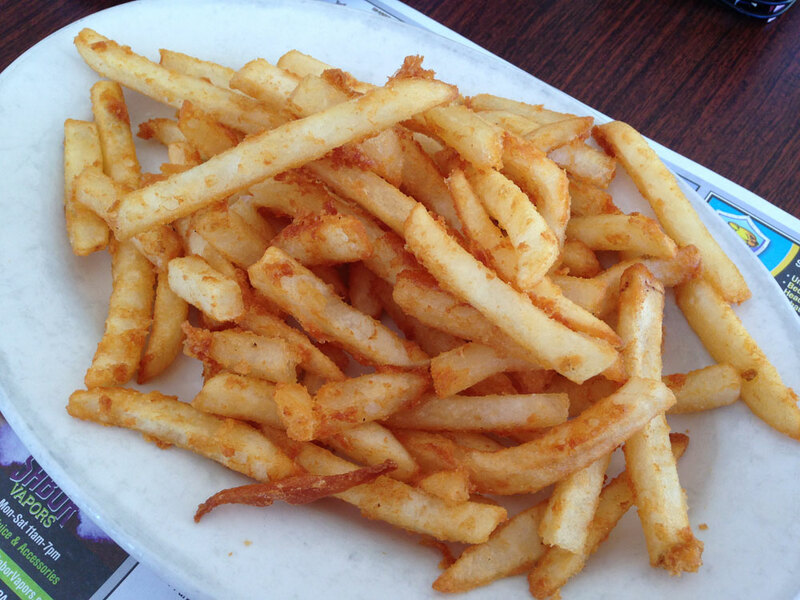 They’re the kind of fries that are great in moderation. There was no moderation with the mound of fries they gave us in the “small” order – a whole plateful of them that I devoured way too quickly. The tradeoff to finishing off the fries was not finishing my half of the pizza. With the pie cut into six slices, we both ate two, leaving two more that Julie reheated for lunch later in the week. Our entire meal (which also included a glass of iced tea for myself), was less than $20. That’s the great thing about pizza and fries – they’re a sharable meal which makes them an economical option anytime. That includes Sunday afternoons, a time when the supply of pizza seems to be cut in half. 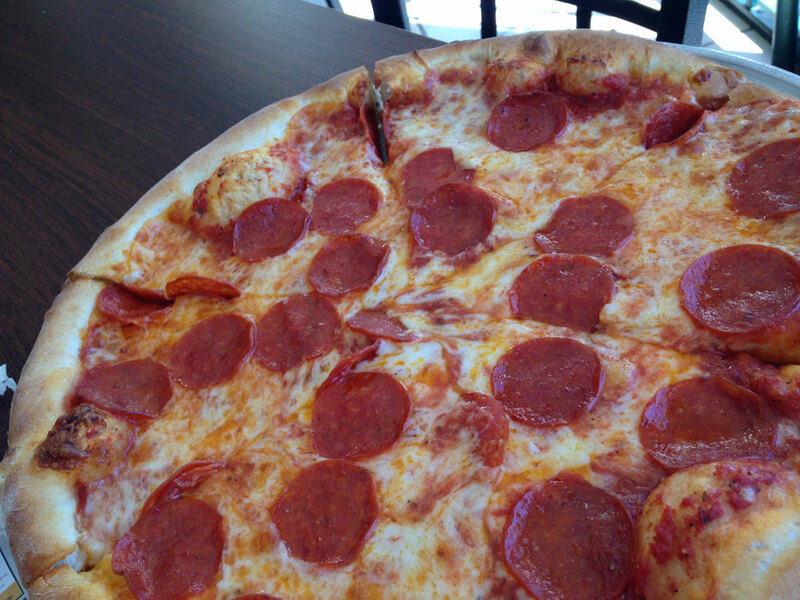 Good thing for us there are places like Esposito’s where we can get a good pizza any day of the week.